Gov. Kenneth E. Mapp promised serious action to address the drowning V.I. government pension system this year. Mapp made the pledge during his second state of the territory address Monday. With a $1.8 billion unfunded liability, the system is spending its trust fund to pay current retirees and projects to be unable to pay full benefits by 2025, if not before. Speaking to the Senate in the Earle B. Ottley Legislative Hall on St. Thomas, the governor also highlighted the improved V.I. budget situation, new government hiring and pay raises. He credited the $220 million cash-influx from the recent sale of the Hovensa refinery, better tourism numbers, an improving economy, and his administration’s policies for the improved situation. But he also cautioned that the one-time Hovensa windfall was only a temporary budget respite. – "Senators call tone of speech, ‘A Breath of Fresh Air’"
During a long and wide-ranging speech, the governor touched on everything from police training to V.I. Centennial celebrations. "This year, one of my administration’s top priority will be the challenges plaguing the Government Employees Retirement System," Mapp said, adding that while the government is beginning to make current contributions on time, "major reforms … must now be addressed. Acknowledging there are no easy fixes, the governor nixed the idea of fixing the plan by borrowing. "Floating $600 million in pension obligation bonds and turning these funds over to GERS to purchase an additional 22 years of life of the system is not a fix," he said. "My finance team and I will work with members of the GERS board, its consultants, its administrator and our financial advisors to present a comprehensive plan to the community and retirees on how we believe we can fix this vexing problem once and for all," he said. He asked the Legislature to add two members "who must bring investment and hedge-fund management expertise," to the GERS board. He said the administration is looking at public pension programs across the U.S. "that also held large unfunded liabilities and experienced liquidity and poor investment performance." The pension fund has had fairly good investment performance, but is underfunded due to structural imbalances between contribution levels and benefit levels. Mapp said his new review would look at specific steps other pension plans took and what reforms were effective. "In short, I want a comprehensive and final fix of the system. Yes, infusion of capital is required, but first the leakages must be addressed and halted. So this is the year that we all must face our reality and address the shortfalls at the Government Employees Retirement System," Mapp said. Highlighting good news on the territory’s budget, Mapp recalled he entered office inheriting a $91 million budget shorftall and millions owed to the territory’s government pension plan, public utilities, and for public debt payments. In contrast, Mapp said "tonight, my fellow Virgin Islanders, I’m heartened to report to you that the Government of the United States Virgin Islands is receding from the brink of financial collapse; that our territory is surely entering into a state of economic and financial recovery," Mapp said. "That, albeit slowly, we are poised with many opportunities coming before us that I can stand here and say with confidence, if we are prepared and continue doing the hard work, all of our lives and the condition of the territory will vastly improve," he said. He trumpeted implementing government pay raises and being able to begin filling the 876 vacant funded positions in the Fiscal Year 2016 budget, saying the government is "now hiring teachers, police officers, firefighters, EMTs, correction officers, DPNR enforcement officers, revenue agents, school lunch workers, environmental enforcement officers, doctors, nurses, administrative personnel and recreation leaders, to name a few." Also helping the budget, the V.I. Internal Revenue Bureau had collected more than $39.5 million in delinquent taxes over the year – exceeding its projection by $7 million, he said, praising IRB Director Marvin Pickering. But Mapp warned that the government has a structural deficit and the recent windfall and collecting delinquent taxes would "only provide us with a respite." "We must grow the economy, to provide new jobs and new revenues," he said. "We believe if we can stay our course we may avoid borrowing for operating expenses for the next two fiscal years." Meanwhile, he said the government will "undertake a comprehensive look at all of our taxes and fee structures to determine the efficiency of how we generate revenues." "We want to stop hurting and inhibiting the growth of small businesses through taxes, fees and regulations. Most of our economic growth will come through small to medium size business activity and we must help this sector grow," he said. Thanking senators for supporting the new oil-storage concession agreement for the shuttered St. Croix refinery, Mapp again recounted the financial terms, 200 expected jobs, environmental cleanup provisions and the government’s acquiring land and homes on the former refinery property. While most of his comments on the sale revisited the recent history of the sale (See Related Links below) the governor revealed the government will shortly sign an agreement leasing 80 of the 121 homes it now owns for about $2.6 million for two years. Competing for tourism is crucial and that sector of the economy is growing, he said. 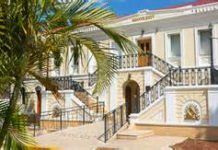 But he said the shopping areas around St. Thomas’ West Indian Company dock "feel and appear to be an out of date, stale, shopping experience." "I am asking both WICO and GERS to present a plan to me within the next 90 days on how they would reinvigorate and reenergize the visitor experience at this site. I want both entities to know that I have no interest in viewing only new plants, new pictures and new paint. I want to see a plan that will drive visitor spending up and an experience that will lure cruise ship visitors back to the territory as overnight guests," he said. He said he has asked the Legislature to "make continuous annual training" for taxi drivers "a condition for license renewal. He also plans to send legislation "soon to reposition horse racing in the territory as a centerpiece of sports tourism in this region." The plan will "require substantial capital investment from a private sector partner," but "we will offer very few, if any, tax incentives," he said. Mapp said his administration is going to propose a comprehensive waste reduction program,with mandated recycling and composting. "This law will include a refund value on every beverage container sold in our territory, containers which will be refundable through reverse vending machines," Mapp said. It will also include "a ban on plastic checkout bags and non-recyclable paper bags." 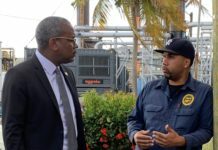 But he is "dropping the long held concept of waste to energy systems for the Virgin Islands as an option for managing solid waste." He said the territory does not produce enough waste and would have trouble getting an EPA permit. Instead, he feels "our task is to find buyers for the mineable refuse that exists in our landfills." "In this process we will open areas at the same site to manage recyclable and composting materials. We will export those portions of our waste that can be reused and sold. I will ask the Senate to host public hearings as we seek to change course and manage our solid waste in a manner consistent with other developed nations," he said. 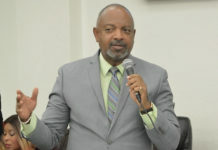 The Department of Planning and Natural Resources has seen big improvements in grant management, after facing serious problems in past years, Mapp said. He said U.S. Environmental Protection Agency Regional Administrator Judith Enck had given them a report showing the territory had $37 million in grant funding available, dating back to 2011. "To date, as much as $27 million is available for water infrastructure projects, to include the replacement of existing but corroded potable water lines. I can assure the people of the Virgin Islands that we will make every effort to spend these monies appropriately and timely," Mapp said. Mapp introduced Michelle Davis, his new nominee for commissioner of the Department of Health. Before joining the administration, Davis worked with the U.S. Department of Health and Human Services as regional health administrator for the New York Regional Office, where she managed more than 600 staff members, Mapp said. Davis went to the University of Michigan as an undergraduate, studying biology and psychology. Then she went to the University of South Carolina; Johns Hopkins and the University of North Carolina, where she majored in epidemiology for her graduate degrees, Mapp said. Mapp announced several crime fighting initiatives, saying V.I. Attorney General Claude Walker and U.S. Attorney Ronald Sharpe have entered into a memorandum of understanding, detailing how both offices can work together. He announced the New York Police Department has approved a request to accept and train V.I. Police officers at the New York Police Academy. Those final details are being worked out. "In April of this year, the first eight police officers from the territory will be sent to New York City for training," he said. "Our objective is to dispatch 16 officers per year, representing both districts for training at the New York Police Academy." In closing the speech, Mapp said a year ago, in his first State of the Territory address, he promised a "creative approach to governance" and pledged "innovation, efficiency and accountability." He said the administration is working to deliver on those promises. "I am human, not perfect. Each day I hope to learn more and become a better governor. With your patience, guidance and prayers, I will continue to move this territory forward," Mapp said.